Replacing your toilet door locks is much easier and cheaper than you probably think. If you’re a pub landlord, restaurant owner or perhaps you run a gym or fitness centre then we’re sure you’ve had problems with your cubicle door locks before and no-doubt getting tired of replacing those cheap toilet door locks each and every time they get damaged or someone gets locked in! 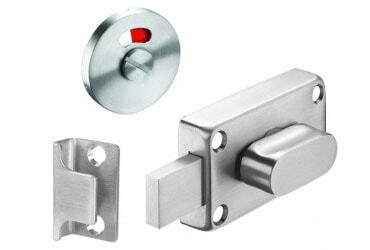 Try our quality stainless steel toilet door locks for cubicles and toilet doors which are stronger than cheap aluminium locks and look much more modern with a brushed stainless steel finish, flush fitting and a red and white indicator to show your patrons if the toilet cubicle is in use. Super easy to fit as a replacement lock or if being fitted to new doors, each of our toilet door locks comes with easy to follow fitting instructions and templates which can also be downloaded here. No need to look any further our toilet door lock pack is offered at the lowest price in the UK while also as it is supplied complete with fixings and indicator you won’t need to purchase any additional items to fit it, making your replacement or new toilet door lock much more affordable than buying from high street DIY shops.